As sweet as cinnamon: Do you want a pincushion too? we made for the 'Fresh Hope' Charity. The pattern for the quilt is available very soon. and there is a free one to make as well. Here's the pincushion I made and sent to Jenny! Would you like one too???? the closest to it will win it! I think red and blue. I think shades of green. Now the colour.... I'm thinking a soft peach colour theme......yeah sort of those Aston Manor sort of colours. How about yellow and blue? Taupes and pinks maybe Dawn. Love your pinnie Dawn :o). No idea *grin* but I do love this one... gorgeous work!! I think it will be raspberry, sky and snow. Well, let's call it red, white and blue! I think it is going to be aqua. My new favorite color. I'm like Illene, I think someone already guessed my colors, but I'm going to say them anyway...pink, cream, and soft green! I love the pincushion! I hoping purples are the colour!?! I'm going to guess warm "cinnamony" colors, maybe with some gold? My first guess would be butter yellow and light denim blue. My other guess would be lime and lilac. Thanks for this chance...a bit of fun.. I have been trying to make a pyramid pin cushion but gave up, I love yours and can make that. I think you will use the scraps from the ironing board cover (another great idea) for the next pin cushion. Seems like all the colours have been picked already - I'm going to say Cinnnamon! What color will you use? I say the color of cinnamon rolls, cinnamon, and the color of the creamy frosting. Sounds good enough to eat, almost. Have a super great pincushiony day. I'm going to guess that the new Pincushion will be Green & Gold. I'm betting on a yellowy lime green with orange and touches of white. Your pincushion is gorgeous Dawn. I just adore those Rouennerries fabrics! I will guess blue and chocolate brown... but I think it would look lovely in any colour!! My guess is a cinnamony colour and with some sort of creamy frosting to go with it. Love those colour!. ooohhh, I'm too late, coz my colour guesses have been taken...I was thinking cinnamon colours, (of course!) with perhaps a pink or chocolate colour to go with it!...Oh well, at least it gives me the chance to tell you how wonderful I think your pincushion design is!!!! I think blue and white, lovely fresh colours. 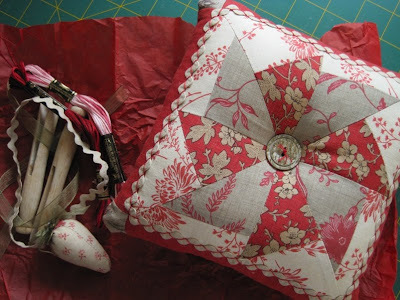 Love the pincushion swaps by the way. Beautiful finish of your pincushion! Maybe black with tan or white? I think I am "too little too late" but would like to take a chance anyway. First of all, your pincushion is absolutely delightful! My guess is shades of cream, tan and chocolate brown, perhaps with a little lime green thrown in. Sending you lots of love as always. I think.... lilac and green with a tiny bit of apricot color? I'll go for lilac, purple and cream although the Rouenneries fabric is my all time favourite and I think another just like it would be perfect! Wah, I missed it - stupid internet - but that's ok, I'm glad, because I have my lovely quilt to look at and drool over! Honestly Dawn, I pet it at least once a day.